In a recent work, we optimized an airborne optical sensor, which is typically built into an impressive device for sensing data remotely, e.g. from helicopters. The mirror blanks for the optical sensor are made from glass ceramics with an extremely low thermal expansion and dynamic operation behavior, in which geometrical shape and displacement must be kept within very small limits under working conditions. Moreover, for this specific airborne application, the weight of the mirror blank needed to be minimized. Both requirements – the minimum deformation during operation and the low weight – dominate the design of the product. The aim of this study was to provide a fully parametric model of the mirror blank’s shape in CAESES®, analyze and optimize the model within ANSYS Workbench using a coupled connection between the two software packages. The parametric model defined in CAESES was made available to the Workbench through the CAESES ACT App, and linked to Modal and Static Structural systems. The results of the optimization process are presented such that they can be used as an aid to selecting the most favorable design for the envisioned mirror blank application. 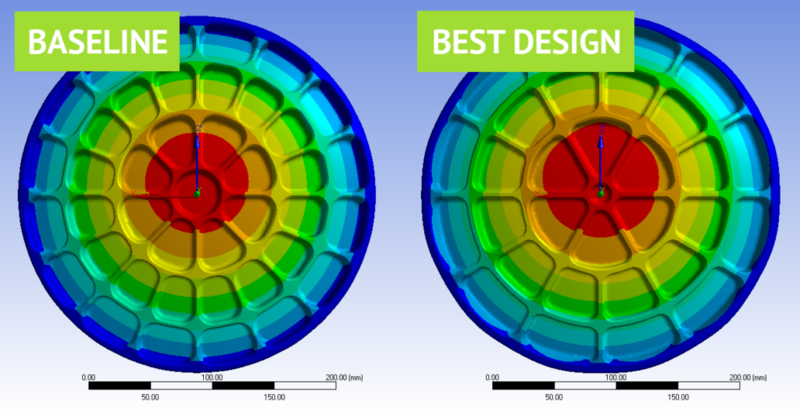 This interesting study was presented at the CADFEM ANSYS Simulation Conference 2017. Download the full paper “Utilizing CAESES’ Parametric CAD Engine in ANSYS’ Workbench“, which includes a more detailed summary of this work. ← Wageningen B-Series: Online Propeller Tool Released!